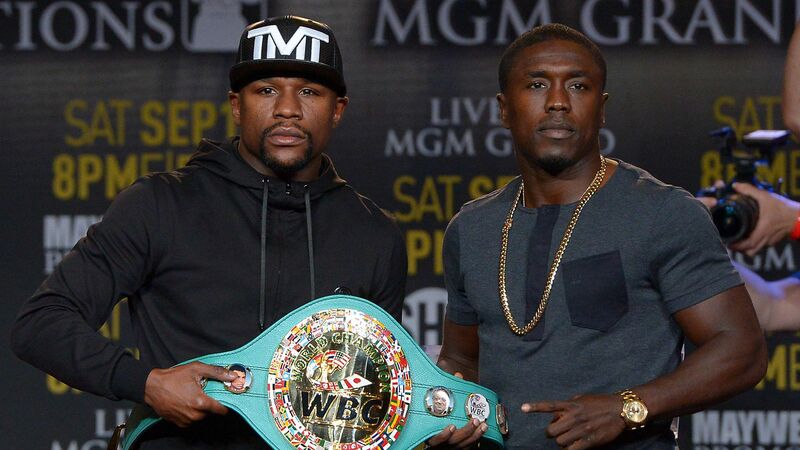 Floyd Mayweather (48-0, 26 KO) has tapped Andre Berto (30-3, 23 KO) as his last opponent. Widely regarded as a mismatch, the public has scoffed at Mayweather-Berto. Why not Keith Thurman? Amir Khan? Kell Brook? Gennady Golovkin? Mayweather-Golovkin is a preposterous proposition. Golovkin, who previously acknowledged that Mayweather was too small for him, has recently pretended to be near Mayweather's size. "Look at me, I'm small [enough to fight Floyd Mayweather]!" Golovkin told ESPN. Golovkin was recently seen towering over David Lemieux in the press conference to their fight. Mayweather, small and not a prominent heavy hitter at welterweight, does not punch hard enough to compete against middleweights. A middleweight who would be phased by Mayweather's power should consider another sport. Anyone who doubts that Mayweather is a better athlete who demonstrates greater technical mastery than Golovkin is seriously confused. Lacking solid competition at middleweight, Golovkin has captivated the public as a boogeyman whose resume is thin. Do not be fooled by Golovkin: it requires a middleweight frame to be heavy handed for that weight. Given the now known cognitive decline of Roger Mayweather, which Floyd Mayweather primarily atributes to boxing, why, at age thirty-eight, would he choose to fight a heavy-handed middleweight with his frame? The same goes for Keith Thurman. On paper, Thurman does not have a significant win to date; he is simply scary. Amir Khan, despite being more of a threat to Mayweather than Pacquiao, because of his length, would be regarded by the boxing media as a cherrypick. At this point, Mayweather would forever avoid fighting either Khan or Thurman unless either brought something of value to Mayweather. The mastermind that is Floyd Mayweather recognizes that, at this point in history, he would be sacrificing himself in facing either of these men for nothing more than the oohs and aahs of their small fan bases, which in the course of history would be forgotten unless any of them achieved more. Mayweather's name and accomplishments offers the world to any opponent while he gains nothing. "You put this guy on a pedestal….If Manny Pacquiao is so great, what does that make me?" It was only because the aura of Pacquiao never went away that Mayweather finally stood something to gain by beating him. In thirty years, no one may remember Amir Khan, Keith Thurman, or Gennady Golovkin. Andre Berto offers to Mayweather the fact that he is a former world champion, increasing the count of world champions defeated by Floyd Mayweather, which cannot be disputed on paper, which is to say, cannot be historically disputed. He offers the fulfillment of Mayweather's Showtime contract. It should be remembered that Mayweather criticized the NFL's indefinite suspension of Ray Rice following an assault on his wife. Anyone familiar with Mayweather's statements on race and ethnicity over the years would know that what prompted that response from Mayweather was a white public's fascination with attacking a black athlete. Indeed, Floyd Mayweather – brash, arrogant, cocky. Ronda Rousey, who has been on record stating that she imitated Mayweather's showmanship and trash talking, is just wonderful. In some way, her smugness and arrogance is cute. This is a longstanding racist double standard that has always existed in America. Which brings me to my last point. Of Haitian-African descent, Andre Berto is thus an African-American. On what is for him an historical occasion – tying Rocky Marciano's record – Mayweather would likely prefer to grant that opportunity to another African-American. Mayweather, who was booed himself alongside cheers for a "foreigner" in Manny Pacquiao by an American public, has expressed disgust with this gesture by the public. Even Virgil Hunter, the trainer of Andre Berto, has been on record stating that if the Mayweather-Berto fight was close, a faction would want Mayweather to lose and thus Mayweather would not get the decision. If even Virgil Hunter hints at the racism towards Floyd Mayweather and African-American athletes, juxtaposed with his praises of Mayweather, one can presume that Berto does not enter this fight with the mindset of destroying the image of Floyd Mayweather. Moreover, in recent losses, Berto has been given to imitating Mayweather's shoulder roll defense. It is a given that Berto and his trainer have immense respect for Floyd Mayweather. I expect Berto to want to give a good account of himself and that he would be satisfied with that. I also do not expect that Mayweather will want to go out of his way to score a knockout of Andre Berto. In part, Mayweather has done Berto a favor by selecting him as an opponent. For Berto will have a record earning and will not feel obliged to continue in the sport given his previous setbacks and injuries. The prediction? Simple. Mayweather by unanimous decision. The broadcast begins at 8pm US Eastern time on Showtime pay-per-view. For viewers in the United Kingdom, the broadcast begins at 1am on BoxNation.